Everyone knows that I adore anything monogrammed. Now make that monogrammed something in a Lilly Pulitzer print, and I’m in love! The Monogram Merchant has a wonderful selection of Lilly Pulitzer personalized items. The Lilly Pulitzer acrylic tray is perfect for parties and entertaining. Imagine breakfast in bed on this adorable personalized tray. 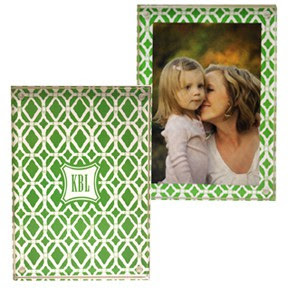 Available in two sizes, the tray can be personalized with a name or monogram. The private property print is one of my favorites. Store your treasured family recipes in the pretty and practical acrylic recipe box. The recipe box and cards are both personalized. Although the recipe box and cards can be personalized in a variety of Lilly Pulitzer prints, my favorite is the Checking In print. These would be an ideal gift for a Lilly loving bride at a shower or a housewarming gift for a friend. You all probably have several Lilly Pulitzer picture frames, but are they personalized or monogrammed? I particularly love the frame in the Green Private Party from the Monogram Merchant. This print matches almost any décor. Without a doubt, Lilly Pulitzer’s personalized pièce de résistance is the acrylic ice bucket. You can personalize a bucket for your next party. If you order one now, you’ll have it in time for your Labor Day party! The double-walled acrylic ice bucket with matching tongs is perfect for every event and holds just enough ice for a crowd. Personalize or monogram 10 different print stories in over 20 different font and monogram styles. Choose the color of your monogram from a preppy palette of 15 gorgeous colors. The possibilities are endless. The Monogram Merchant is a great resource for Lilly Pulitzer personalized or monogrammed items. You can find them on facebook, too. The Monogram Merchant is sponsoring a giveaway for Maryland Pink and Green followers! Note: You must be a blog follower to be eligible for this giveaway. One lucky Lilly Lover will receive a personalized or monogrammed acrylic ice bucket of choice. The winner will have a fun Lilly item for her Labor Day party! So much fun! You’re in luck, too, because there are so many ways to win. After completing the steps you choose to enter the giveaway, leave ONE comment below this post with links as needed. In your comment, tell me how many entries to give to you. That's up to 6 entries! The contest will end on Friday, August 12 at midnight. The winner will be chosen on Random.org and will be announced on Saturday, August 13. Thanks to the Monogram Merchant for sponsoring this giveaway. 1. My favorite item are the monogrammed blackberry cases. love the personalized candy hearts platter. conviently I just purchased my 1st place, so I need a housewarming gift for me! 1. My favorite item is the Lilly Pulitzer acrylic tray! 2. I like the Monogram Merchant on DB. Ooh la la! My favorite item IS the ice bucket! I've been dreaming about one for AGES. I also "like" both the MM and Maryland Pink and Green on Facebook! Thanks! 2. I love the monogrammed iPhone cases - especially the chevron one. My favorite is the lilly p. Tray in the checking in pattern!!! I am a fan of monogram merchant on Facebook, of course!! I like Maryland pink and green on Facebook! Such a AMAZING giveaway! I have my fingers crossed for this one! My favorite ice bucket is the Lilly Pulitzer Private Property bucket. It would match my decor PERFECTLY as it has blue and pink and green! I like you and Monogram Merchant on Facebook and tweeted about the giveaway too. Thank you for hosting B! What a fantastic giveaway! I'm a longtime follower! My favorite item from the Monogram Merchant is the monogrammed Tervis Tumblers. I cannot live without them, especially in the hot summer! I like the Monogram Merchant on facebook. I like Maryland Pink & Green on facebook. Holy Cow, I didn't have to go far into the site (though Cynthia is an old business friend of mine) to find those fabulous Palm Beach ice buckets. They are fabulous!! I like MM on FB and I now like you on FB (Laurie Tester). I'll be back for more entries. I like both on facebook and I posted to link on my facebook page. I love the giveaway! The Lilly Pulitzer Dirty Shirley Personalized Tray is one of my favorite items at the Monogram Merchant. Can you give me 5 entries? Thanks so much!! I love the black and lime zebra glass cutting board! 2. I like MM on facebook! 3. I like MP&G on facebook! Thank you so much! crossing my fingers!!! 1~ Love any of the Lilly serving trays. So cute!!!! 2~Like MM on my facebook! 3~Like Maryland Pink and Green on facebook! 5~Shared the link on my facebook! No idea how to blog yet but maybe in my future. So that's 5! Love your blog~~glad I found it. 1. My favorite item is the monogrammed recipe box.. I would love to get one as a bridal shower gift! 1. So hard to choose, but I do like the Lilly tray in Silver Dollars. Even in the depth of winter, it would be nice to use this and be reminded of Summer. 3. I follow you on FB, too. My favorite item is the monogrammed navy links tray. I liked the Monogram Merchant on Facebook. I liked Maryland Pink and Green on Facebook. I just found your blog and I am loving it! Such a great giveaway, they have the cutest Lilly stuff. I especially like the tray and Lilly stationary cards! I like the monogrammed plates and trays! Following you on GFC as Ashley Brooke! My favorite item is the personalized Lilly acrylic tray! 2. I Like The Monogram Merchant on Facebook. I love your point of view! I checked out the Monogram Merchant and looked through all their fabulous things. My favorite is the green private party acrylic tray. I LOVE the Blue Damask Monogrammed Blackberry Cover. And I liked the Monogrammed Merchant and Maryland Pink and Green on Facebook! 1. My favorite item is the Lilly Pulitzer Silver Dollars Personalized Recipe Box. 3. I like Maryland Pink and Green on Facebook. I absolutely love the trays- they are such a great addition to my girls' night get togethers- would love to have an ice bucket to go with them! LOVE this and you know what's even more funny…I already had this posted for Monday's post about how much I love MM! Take a look tomorrow…I'll be blogging about your giveaway! My favorite…probably the ice bucket! I love it all though! Tough decisions! 1.My favorite item is the Lilly acrylic trays! 3. I already like MD Pink and Green on FB! My fav item from MM is the Emma Classic Monogram Sandals! 1. I write a hand-written letter every day -- so I love the correspondence cards -- Fresh Catch Toile is my fave! 2. I liked MM on FB. 3. I liked MPaG on FV. 4. Shared this give away on Twitter. 5. Sharing it on my blog Monday (8/8) entry. 6. Sharing it on my FB Page. I think that's all 6 entries! My favorite item is the monogrammed Chevron phone case. Adding this to my sidebar now. I love the Ice bucket in Silver dollars. I get 2 entries for following you on the blog and liking Maryland Pink & Green on Facebook. Entry 1: I love the Lilly Pulitzer recipe cards! So cute! 1.I like the monogrammed coasters in pink and green houndstooth! What a fabulous giveaway!!!! They have so many amazing products that it was hard to pick just one favorite. I love the Monogrammed Circle Tag Sterling Silver Necklace. Yeah!!!! That gives me two entries. My favorite would actually be the Lilly ice bucket in private property. I am a newlywed and new home owner, and an ice bucket is one thing that we desperately need but have not received! Of course I follow the blog but also like MM on Facebook. I love the monogrammed capri juice set. how chic! I follow you as well of course. My favorite is the large round monogram pendant. I am a new follower! I love the royal blue ice bucket with a white monogram!! I am a follower, I tweeted your it, and I liked both facebook pages! My favorite item is the ice bucket for sure! What a fabulous giveaway! I love the Jonathan Adler Peacock Tray. I like the Personalized Sticky Notes in Green Diamond. Thank you for the review and chance to win. The Lilly tray in Silver Dollars makes a great housewarming gift. I looove the Hobe Sound Extra Large Half Moon Straw Bag! It would be so cute for a summer party or lunch or the beach! 1. I love the monogrammed letter boxes – especially in the American flag pattern! Such a cute give away. Love your sweet blog and follow. Loving the acrylic trays right now. Love and follow your blog! 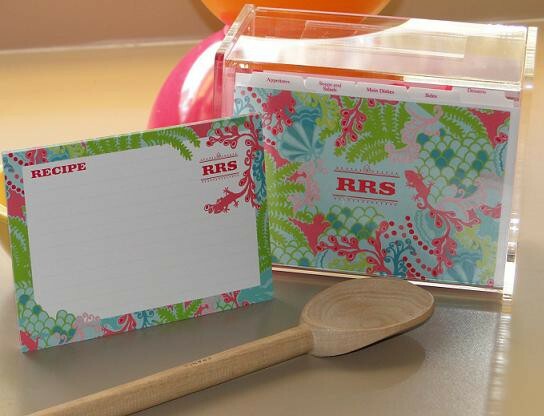 I NEED to have the Lilly Pulitzer--Recipe Boxes especially with a new kitchen. Hands down...monogrammed recipe box. Too cute. Thanks for giving us this opportunity and have a great day! Love your blog! So many favorites hard to choose one. I will have to go with the monogrammed Bonano's! 1. Would love some Tervis Tumblers! 1. I love the acrylic trays. 2. I like MPAG on FB. 3. I like MM on FB. 4. I tweeted the offer. 5. I shared this on my FB page. 1. I LOVE the correspondence cards, I've been looking to get some done for myself! 3. Like Maryland Pink and Green on Facebook - emillie rose. 4. Share this giveaway on Twitter with @ilovelillymd and @TheMonogramMe - http://twitter.com/#!/HisPrincess886/status/102143498597314562. 5. Share this giveaway on your facebook page with link - https://www.facebook.com/permalink.php?story_fbid=231269043582780&id=100001891505536. Just found your blog! Love it soo much! 1. 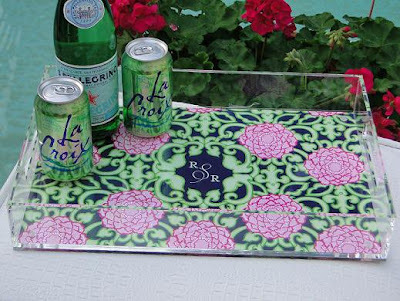 My favorite item would have to be the the lilly pulitzer white zin personalized tray! It is so pretty! 3. I now like you on FB! Monogrammed Sticky Notes in Gray Damask - is my favorite item! !